CMT Inc.'s original website was created elsewhere, but they were getting their printed materials through The Idea Factory. Increasingly frustrated with their website hosting company they accepted an opportunity to create a new web presence and clear up their hosting and maintenance problems by using a company they already trusted with other business. In addition to CMT's business cards, The Idea Factory has also supplied a product specs catalog, a guarantee certificate and other items used in the conduct of their daily business. Perhaps you have similar needs? Contact us. 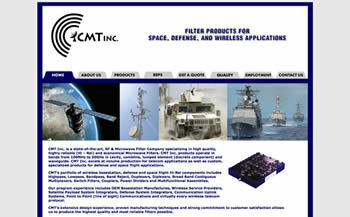 UPDATE: CMT successfully grew their business to the point where they were acquired by a larger company (api technologies corp.) in November 2011. We're sorry to lose our client, but very happy for the success the good people at CMT achieved.